In conjunction with its ongoing officially licensed “The Twilight Zone” subscription series, Dark Hall Mansion is very pleased to reveal our next guest-artist TZ release: “WILL THE REAL MARTIAN PLEASE STAND UP,” by leading contemporary artist, Dave Perillo. A charming and wacky piece that riffs in 12″ x 12″ vintage LP record cover format on a terrific and classic “Twilight Zone” episode, we think you’ll agree Dave’s artwork perfectly suits the somewhat manic quality of this humorous yet pensive episode. Dark Hall Mansion, under license by CBS Consumer Products, will release Dave Perillo’s new “WILL THE REAL MARTIAN PLEASE STAND UP” limited edition prints next Tuesday, June 30th, 2015. Artist Dave Perillo brings to bear the influence of one of his, and DHM’s, favorite artists, the enormously influential, Jim Flora. 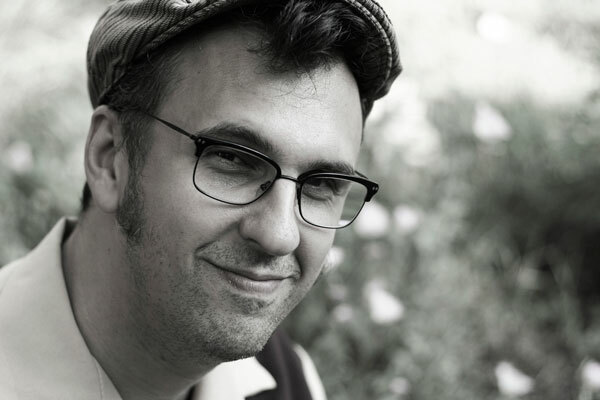 Flora’s unique and highly stylized jazz and pop record cover artwork of the ’40s and ’50s exploded with color and hyper-stylization influencing generations of illustrators in all fields, and Dave Perillo has done him justice! Formatted to appear as the vintage record cover you might always have wanted but not known existed, his 12″ x 12″ “WILL THE REAL MARTIAN PLEASE STAND UP” has all the earmarks of a classic jazz inflected cover from the ’50s while creatively rendering this classic TZ episode’s entire story arc and twist ending in one dynamic piece. Dave’s standard edition hits all the right notes with its vintage LP color palette, one that not only tells the tale but brings forth some very special record cover artwork, from a unique locale indeed-one of sight, sound and mind, and one from where you might just see future Twilight Zone record cover offerings emanate from. To compliment, Dave’s Variant edition pops right off the cover with a color explosion that feels at once slightly frenetic and all cool jazz. There’s also two select wood editions based on the Standard and Variant colorways. Dave Perillo’s Standard and Variant editions will first be made available for advance separate purchase to subscribers of DHM’s ongoing 10-print “Twilight Zone” subscription series (details of which are available HERE And YES! 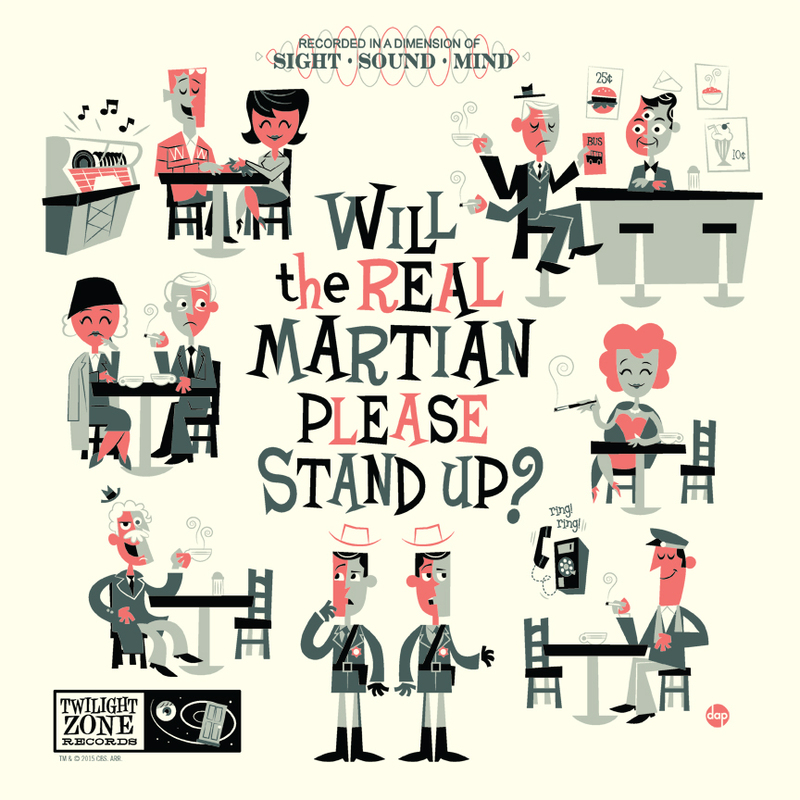 Anyone purchasing a DHM “Twilight Zone” subscription series (while subscriptions last here: http://darkhallmansionstore.com) will be assured a reserve spot with the right, though not obligation, to separately purchase Dave Perillo’s “WILL THE REAL MARTIAN PLEASE STAND UP” print. 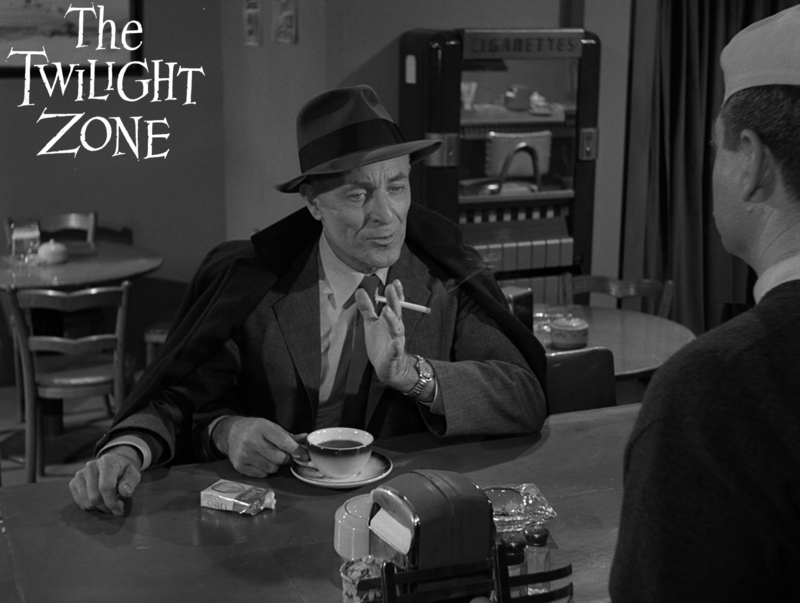 * Purchase of DHM’s Standard edition “Twilight Zone” subscription series entitles the buyer to all 10 prints in our TZ series (further details in DHM’s blog) plus the right to separately purchase Dave’s standard edition “WILL THE REAL MARTIAN PLEASE STAND UP” print. 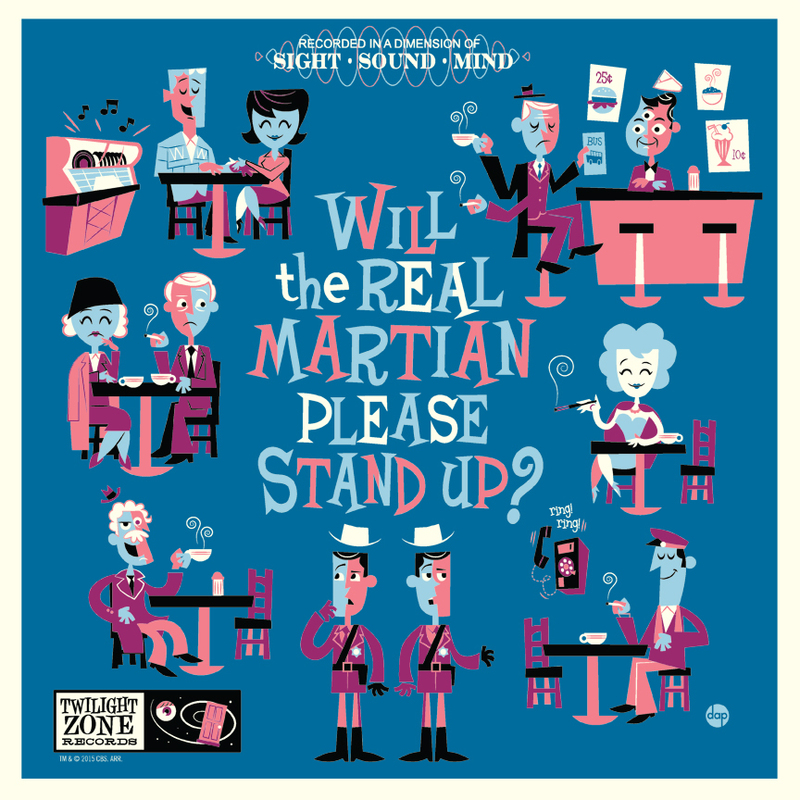 * Similarly, a purchase of the Variant “Twilight Zone” subscription series entitles the buyer to all 10 Variant prints in our TZ series, plus the right to separately purchase Dave’s VARIANT “WILL THE REAL MARTIAN PLEASE STAND UP” print. * Wood editions will be available only on the general sale day, next Tuesday, unless you’re one of our select “Twilight Zone” foil subscription holders in which case you’re assured the right to separately purchase one of Dave’s “WILL THE REAL MARTIAN PLEASE STAND UP” wood editions. Yes, there are a few foil edition TZ subscriptions still available, just inquire with us at: info@darkhallmansion.com for further details. To be clear, you do NOT need to purchase the 10-print “Twilight Zone” subscription series to be able to purchase our Dave Perillo “WILL THE REAL MARTIAN PLEASE STAND UP” prints, however, DHM TZ subscription holders ARE entitled to advance purchase the Perillo prints in advance of the general June 30th on-sale date when all fans can look to purchase! at 9:30 AM PST! Please remember to refresh our store page right at 9:30 AM PST to check out with the edition of your choice. Shipping is $15 for anywhere in the US, or $25 worldwide. This entry was posted in Art, Dark Hall Mansion, Posters, Science Fiction, TV and tagged Dark Hall Mansion, Dave Perillo, Jim Flora, onsale info, The Twilight Zone, Twilight Zone, Will The Real Martian Please Stand Up. Bookmark the permalink.